It’s the day of your big interview. Sharp haircut: check. Suit dry-cleaned: picked it up yesterday. Shoes polished: Mirror Finish. Piercings removed and tattoos covered: …Hmmm. Rolling down those pressed cotton sleeves to hide your real sleeve used to be common practice in office environments. 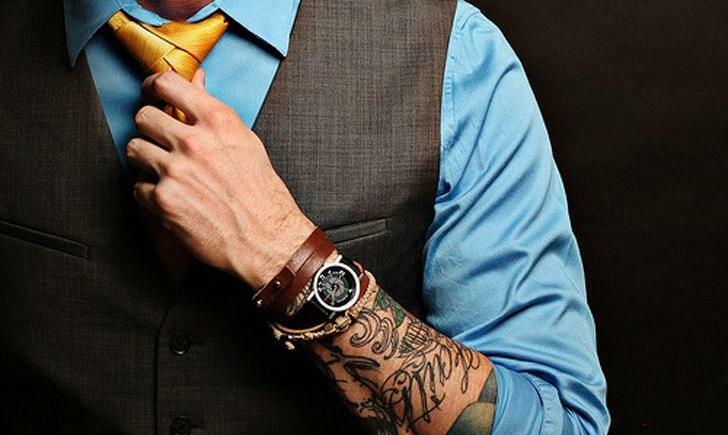 Once you were on the clock, it was strictly business, and the cubicle was not the place to start making personal statements about yourself by exposing your newest tattoo. Once upon a time, these expressive pieces of art were even looked down upon, stigmatized and regarded with a general air of Rebellious Intent. 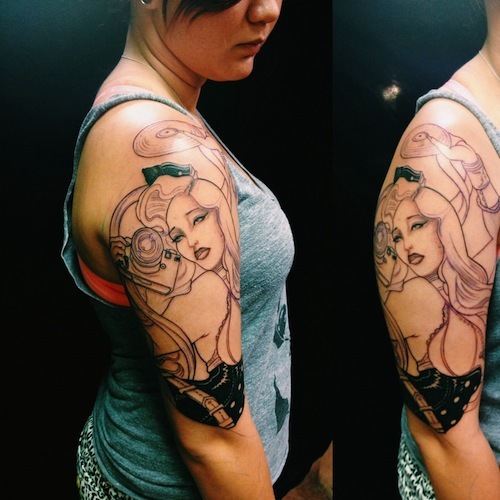 Society’s attitude towards visible tattoos is certainly becoming more relaxed, as tattoos appear in the mainstream on high profile celebrities like Lil Wayne and David Beckham. Athletes sports tattoos all over their bodies. Recently, we’ve seen an influx of tattoo shows on television. When it comes to the workplace, however, it might not always be so straightforward. Depending on the situation and your position, there are a few things to consider before you decide whether to cover up your body art or share these prized pieces in the office with your co-workers. A good spot to get ink if your place of work or profession does not allow for visible tattoos. It’s a given that some industries place greater significance on maintaining a professional appearance and suitable dress. If you have a role that calls for a lot of customer or client interaction, then there may be standards and expectations that require tattoos to be covered up in the workplace. Banking, for example, has traditionally required a conservative, sober appearance, but now, with visible tattoos making an appearance on Wall Street traders, times are surely changing. When you meet someone for the first time in an interview situation, they will inevitably make assumptions about you based on first impressions – we all do, it’s an inescapable aspect of human behavior. We like to think otherwise, be we all judge books by their covers. Operate on this assumption: you don’t know the other person very well and know nothing about their attitudes, tastes or beliefs. In these instances, it is probably sensible to err on the side of caution and cover up your tattoos, if possible. It’d be better to play conservative now and then wow them later than show off your ink too early and run the risk of alienating yourself and others from the get go. This tattoo can be covered up with a long or 3/4 sleeve. Once people get to know you and become familiar with your work habits, aspects of your personality are gradually allowed to shine through, and personal statements like tattoos and significant piercings become more tolerated. But remember, every office has its own atmosphere and each employer has their own criteria for what is and is not acceptable. So judging the environment you work in and taking note of what those around you do with regards to personal appearance should help you decide when it is a good time to cover up and when it’s fitting to share.